This spring’s NIH T32 deadline will be here before you know it. 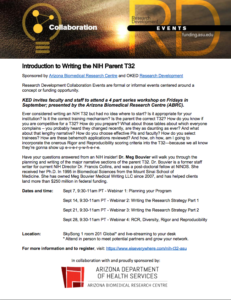 Have all your questions answered about where to start and the new changes from an NIH insider who will walk you through all you need to know about the major narrative sections of the parent T32. This workshop is most appropriate for new submissions, but will also address resubmissions. The T32 mechanism provides a grant mechanism for supporting one to two years of graduate research training in an area relevant to the NIH. 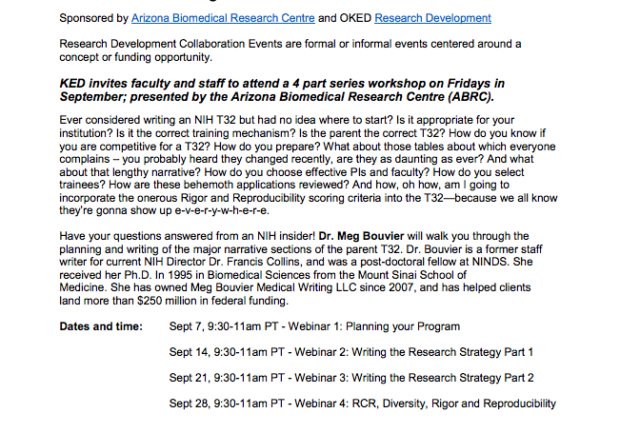 This webinar is funded by the Arizona Biomedical Research Centre. Find more information on the sessions and register.